Right-handed pitcher Charley Schanz worked 13 years in the minor leagues and four full seasons with the Philadelphia Phillies in the 1940s, followed a couple of years later by 14 games with the Boston Red Sox in 1950. His major-league record was 28-43 with a 4.34 earned run average. His best big-league season was his first, when he won 13 games for the Phillies in 1944. He got in a lot of work that first season as a professional – 204 innings. He was 9-16 with a 4.59 earned run average. The following year – the year he turned 20 – Schanz improved his ERA by more than a full run (to 3.49) and was 10-5 on the season, before he was moved up to Class C (Salt Lake City, Pioneer League). There, too, he struggled at first, with a 6.63 ERA in 57 innings. He was 4-3. At the very end of the season, he worked in three games for the Seals, and lost all three, though two of the three were indeed ones he well could have won. Why that made him think he should hold out in the spring of 1940 is difficult to divine, but hold out he did, for a while. He was assigned to the Western International League (Class B) for 1940, and worked both for the Tacoma Tigers and the Yakima Pippins, for a combined 18-9 (4.54), winning 10 consecutive games from the end of July into September. Schanz played for the Seals for the first months of 1941, appearing in 13 games until the very end of June when he was optioned to the Salem (Oregon) Senators. He refused to report and worked out briefly with the Portland Beavers, with the permission of Seals president Charles Graham. Within a week, however, he accepted Graham's "fatherly advice" and agreed to go to Salem.4 He was recalled to the Seals on August 27. Back in the Coast League, he excelled early on. In late June, he was reclassified 1-A and summoned by his draft board for a second physical. He'd been rejected the first time because of his eyesight, and was again. The Padres finished in seventh place, but Schanz still won 17 games (losing 18) with a 3.23 ERA. Again, he was third in the league in strikeouts. 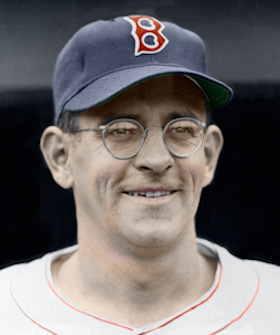 Russ Newland of the San Francisco Chronicle declared that in 1943 "the fellow who did the best pitching job, week in and week out, in our book was bespectacled, lanky Charley Schanz," adding that if he'd pitched for first-place Los Angeles he "probably would have won 30 games. "8 Schanz was selected by the Philadelphia Phillies in the November 1 minor-league draft, the third selection overall. On November 20 he married Doris Roberts of Sacramento. The two had three sons – Gary, Rick, and Kevin. He got through the first three innings well enough, but then was tagged for four runs in the top of the fourth. He was taken out of the game after four and bore the loss in an 8-2 final. Five days later, he got another start against the Giants and secured his first win. The Giants were riding a five-game winning streak, but Schanz held them to three runs in nine innings – and then pitched three more innings, the game being tied, 3-3, until Schanz himself scored the winning run, doubled in by Buster Adams in the bottom of the 12th (Schanz had reached on a successful sacrifice bunt, thanks to an error, with the runner ahead of him later being retired). He was now 1-1, and then won his next three starts, all complete-game efforts. The win that took him to 2-1 was probably the best game of his career, a one-hitter thrown against the Giants at the Polo Grounds. The only hit off him came in the bottom of the seventh. Following a walk, Joe Medwick hit a two-run homer. Philadelphia (and Schanz) won the game, 5-2, after he himself hit a bases-loaded triple in the top of the ninth to break the 2-2 tie. On June 22 he got another win with nine innings of work, but it was nine innings of relief work, winning a 1-0 15-inning game in Boston against the Braves. He shut out the Braves again on September 3. At season's end, Schanz could look back on a good season: a 3.32 ERA and a won/loss record of 13-16 for a last-place (61-92) team. The Phils, managed by Freddie Fitzsimmons, finished 43 ½ games out of first place. After holding out in the spring of 1945, matters were worked out and he reported to camp at the end of the first week of April. He lost his first six decisions, finding himself 0-6 with a 5.11 ERA on May 23. He won his first game with a 2-0, two-hit shutout in St. Louis on May 27. Then he lost six more. A bout with acute jaundice cost him a month, from the shutout until June 30. He said that he came back from the hospitalization sooner than he should have. Sometimes there were errors behind him that cost games, sometimes his team just didn't score runs (in back-to-back losses on July 7 and 15, the Phils scored a total of one run), but sometimes it was his own fault. In the July 15 game, he managed to tie a major-league record by hitting four batters; he was relieved by none other than slugger Jimmie Foxx, who threw 2 2/3 scoreless innings. The 1-12 Schanz may have been discouraged, but he kept up and split his final six decisions, finishing 4-15 with a somewhat respectable 4.35 ERA. The Phillies were 46-108 on the season, in last place, 52 games out of first place and even a full 15 games behind seventh-place Cincinnati. Ben Chapman had taken over as manager after the team's 18-51 start under Fitzsimmons. Schanz started the 1946 season working out of the bullpen, but after the first week in August was restored to the starting rotation. He appeared in 32 games, 15 of them starts. His ERA deteriorated substantially, to 5.80, but he could draw some solace from a 6-6 record with three complete game wins in his last 30 days. The Phillies found him holding out again for '47. "We've offered him our limit," said GM Herb Pennock in December. "If he doesn't want to take that he will have to quit. "9 Two months later, he still hadn't signed, but he was with the team by the time the season began. He pitched in 34 games in 1947, all but six in relief. He recorded a 4.16 ERA and a 2-4 record. The year 1950 was another split year. He opened the season with the Red Sox, and worked exclusively in relief, 14 times, winning three and losing two. After his appearance on July 2, he had an ERA of 8.34. That just wasn't going to cut it, even with a team scoring as many runs as the 1950 Red Sox. They placed Schanz on waivers and he was selected by the St. Louis Browns on July 5. He never joined the Browns, however, and one of the conditions of the deal was that he show up for work. On July 12 the Browns voided the deal, in effect returning him to the Red Sox. He finished out the season back in Seattle. He didn't pitch much better, given that he was now working in Triple A. His ERA for the 103 innings with the Rainiers was 6.29. His time in the big leagues was over. Though Schanz had hit a home run in his first at-bat in professional baseball, with Tucson in 1938, he was never known for his hitting. He managed a .134 average (with one homer in 1944) in the big leagues. He wasn't known for his fielding, either, with a career fielding percentage of .918. Schanz worked four more seasons, all in the Pacific Coast League and each year keeping his ERA under 4.00. The 1951 and 1952 seasons were with Seattle. Released by the Rainiers, he signed as a free agent with Sacramento, back home for the 1953 and 1954 seasons. He generally worked all four years as a reliever with occasional starts; in 1953, though, he started 28 of his 34 games. A sore back hampered him some in his final season, but he still worked 132 innings. After retiring from baseball, Schanz stayed involved locally with youth baseball in the Sacramento area and was one of the founders of the Pacific Little League Park. He worked as a T.B.A. (Tires, Batteries, and Accessories) truck salesman for Tidewater Oil. Schanz died at home from coronary artery disease on May 28, 1992. He is buried at East Lawn Memorial Park in Sacramento. In addition to the sources noted in this biography, the author also accessed Schanz's player file and player questionnaire from the National Baseball Hall of Fame, the Encyclopedia of Minor League Baseball, Retrosheet.org, Baseball-Reference.com, Rod Nelson of SABR's Scouts Committee, and the SABR Minor Leagues Database, accessed online at Baseball-Reference.com. 1 One source from the State of Washington lists Mrs. Schanz as originally Leanah Daily, but the Hadden name comes from Charley Schanz's State of California death certificate. 2 Schanz supplied the information about the baseball camp and signing with Tucson in handwritten notes found in his player file at the National Baseball Hall of Fame. The involvement of Woodall and O'Doul was mentioned in "Schanz Sees Best Chance in Boston," Christian Science Monitor, March 21, 1950: 16. 3 Ed. R. Hughes, "'Phenoms Swarm Over Seals' Camp," San Francisco Chronicle, February 18, 1938: 22. 4 Bob Stevens, "611 Chances – 12 Errors – Equals .980 Average for 'Miracle Man'," San Francisco Chronicle, July 7, 1941: 18. 5 Jack Hand, "Sore Arm Taught Schanz How To Pitch With Head, Too," Washington Post, May 8, 1944: 10. 6 Ibid. A lengthy Will Connolly column went into more depth about Schanz making the adjustment, and the Seals having lost out by letting go the pitcher who had become "the rookie sensation of the majors." Will Connolly, "Will Connolly Says," San Francisco Chronicle, May 5, 1944: 10. 7 "Padres Purchase Tacoma Hurler," San Diego Union, January 2, 1943: 12. 8 Russ Newland, "Credit Bill Skiff – He Did A Whale Of A Job," San Francisco Chronicle, October 2, 1943: 15. 9 Associated Press, "Charley Schanz Philly Holdout," Washington Post, December 12, 1946: 10. 10 "Schanz Sees Best Chance in Boston."